"Oh Lord, forgive me, for I use no gimmick or trick." And so she begins another heist, the mysterious thief Saint Tail. But Saint Tail is not just any thief... she is Meimi Haneoka, average 8th-grader at St. Paulia Private School. And she doesn't steal for her own benefit, either... she only steals to help people and to return items to their rightful owners, something like a modern-day Robin Hood. Meimi's closest friend is Seira, her classmate and a nun-in-training at the school. When Seira does her nun training in the chapel, people from the town come to her with problems. Sometimes, the problems are something that Seira thinks that she can and should help with. This is where Saint Tail comes in. Meimi, the daughter of a magician and an acrobatic thief, has a natural talent for this kind of work. Meimi's intent is, of course, not criminal, but philanthropic in nature. However, she is still stealing... and so, the police are still after her. The head detective on the Saint Tail case is one Asuka Keiji. He has a son named Asuka Daichi, or Asuka Junior, who just happens to be Meimi and Seira's classmate. Unfortunately for Meimi, Asuka Jr. follows very closely in his father's footsteps and has even become an honorary detective on the Saint Tail case by way of the Mayor. Every time she pulls a caper, Meimi can count on Asuka Jr. to be there and try to capture her. He doesn't have much success, but he's very persistent like most eighth grade boys are wont to be. Only Seira and Meimi's pet hedgehog Ruby are privy to the secret identity of Saint Tail. Sometimes, though, Meimi has trouble keeping the secret. Many times she is almost found out by Asuka Jr., but also like eighth grade boys are likely to do, he doesn't really get the big picture when it comes to the girl who is the object of his attentions. Asuka Jr. is attracted to both Meimi and Saint Tail, but he has no clue that they are one in the same. It makes one wonder what would happen if he ever found out..? Saint Tail is made a well-rounded series by the fun soundtrack and the prolific seiyuu. The first season opening theme, Toki wo Koete performed by Yasuko Matsuyuki, sounds almost like a theme from an old 70's cop show. 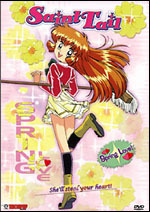 The first season ending theme, Junshin, is performed by Shoko Inoue. The Japanese voice for Meimi comes from Sakurai Tomo (Shayla-Shayla, El Hazard; Marin, Akazukin Chacha; Sara, Shamanic Princess) and Seira's voice is Inoue Kikuko (Tendou Kasumi, Ranma 1/2; Belldandy, Ah, Megami-sama; Mima Toyoko, Key the Metal Idol). 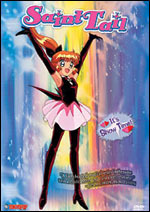 Saint Tail is being distributed in the United States currently under TOKYOPOP licensure. As I'm sure you have noticed, there are a lot of religious references in this series, and they are still there in the subtitles, but for some reason, TOKYOPOP chose to meticulously leave every single religious reference out of the dub track entirely for reasons unknown to this author. 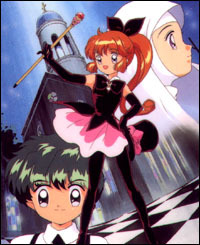 Saint Tail is based on the manga by Megumi Tachigawa and began airing on Japanese television on October 12, 1995. The series ran for 43 episodes and concluded on September 12, 1996. Even though the series is several years old, it doesn't really show it's age. AKA Asuka Jr. Son of Detective Asuka, classmate of Meimi, Seira, and Rina. He was given a medal by the Mayor, making him an honorary detective on the Saint Tail case, an honor that he takes a lot of pride in. He spends most of his time outside of school pursuing Saint Tail in her criminal escapades in an attempt to arrest her. 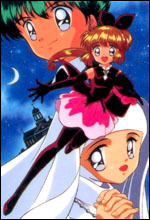 Asuka Jr. is attracted to both Saint Tail and Meimi, but he does not know that they are the same person. 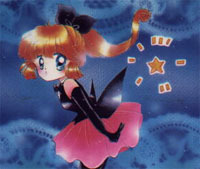 The Mayor's niece, classmate of Meimi, Seira, and Asuka Jr. She arrives on the scene and decides that she also wants to join in the efforts to capture Saint Tail, but she ends up only serving to complicate matters for Asuka Jr. She also seems to have a crush on Asuka Jr., but his attentions are always directed towards Saint Tail, which frustrates Rina a great deal. Meimi's father, married to Eimi. He is a magician, and he met Eimi and fell in love with her while he was still in training. He is constantly working on new magic tricks. He has passed his love and talent for magic on to Meimi, but is completely unaware that his daughter is the mysterious thief Saint Tail.